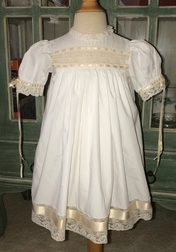 Heirloom dress, Easter dress flower girl dress Communion Confirmation dress vintage flower girl dress with French lace, entredeux and satin ribbon. We start with batiste fabric in a color of your choice and create a flowing square yoke dress. The yoke/bodice is embellished with a fancy band crafted with large entredeux woven with satin ribbon, 2 rows of 1/2” French lace and finished with the entredeux. All lace and ribbon will be ecru. 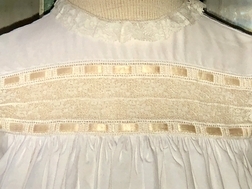 The neck is trimmed with lace. 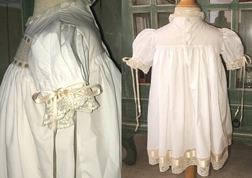 The puff sleeves have a smaller entredeux with woven satin ribbon tying in to pretty bows and are finished with 1” wide French lace. And, a beautiful feature of the dress skirt is a fancy band made with French lace, satin ribbon, French lace and wide satin ribbon. 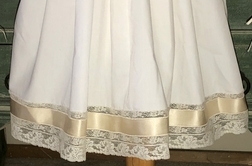 The hem is trimmed in the same 1” lace as the sleeves. NOTE: The fancy bands may use more lace and wider ribbon on the large size dresses.